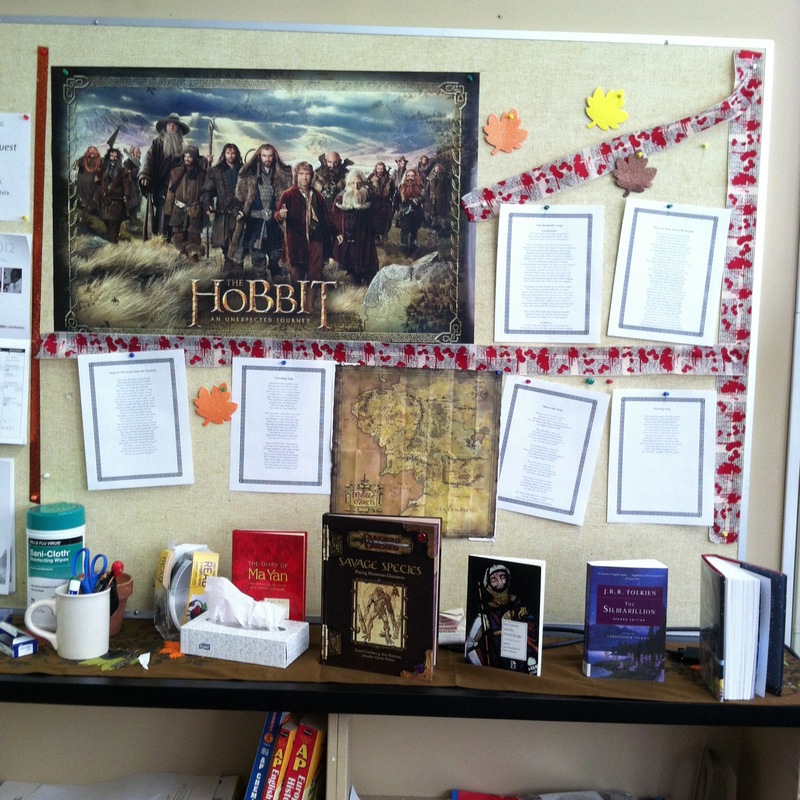 Joy of Displays: Where The Hobbit, history and poetry live together. This blog has been quiet as this year has been busy and complicated for me. A major project that I recently finished is creating the Library’s website, which is linked here and in the sidebar, over time, it will change to reflect how it’s used by students. 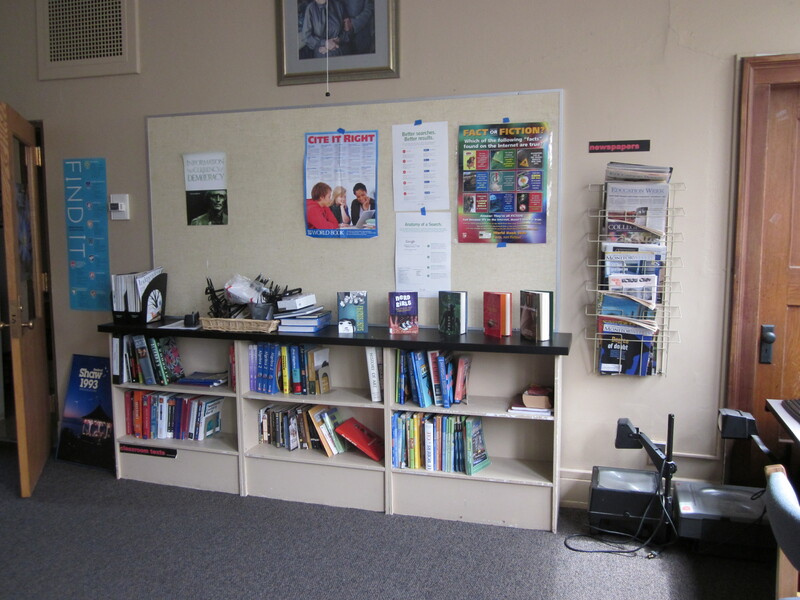 A large part of what I’ve done this year has been about the physical space, how do students use it and think about it. To connect with them even when I’m not there, I’ve done a lot of work on the bulletin board at the front. From what I observed when I began the job, it didn’t look like it had been used for much other than school announcements and a few posters. My first display was put together with posters I found on citations and with the help of my fellow librarian at the other campus, it gave me a sense of how I could use the space. It also showed me how students react to what I put up, one of the posters I had posted was from World Book and about internet myths. In truth it was better suited to middle school or possibly elementary school then my shared middle/high school library but I didn’t realize how much so until I student wrote a note under it. Now the note was a little sarcastic but showed me that to make my displays work, they needed to hit the right level for all the students who entered my library. I decided for my next display to focus on Halloween, in preparation I got in touch with English teachers to find out what authors were being read and how I might post some works that connected with current classes. In the end, I got a few ideas and then had the chance to make the space mine by going shopping at Michael’s for ways to transform the bulletin board. My collection was a wonderful mix of fall and Halloween decorations and my major find, a Hobbit poster. 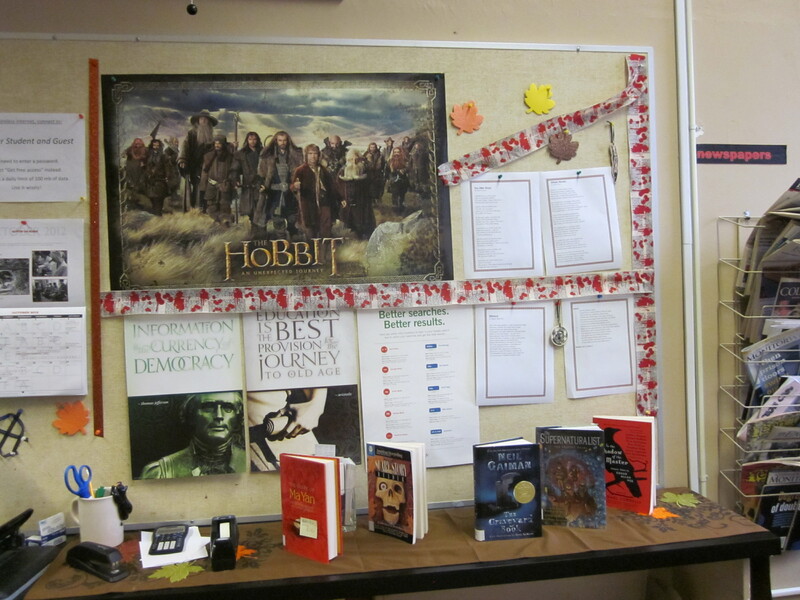 Below you can see what the display looked like, the first day it went up, a student asked me where I found the Hobbit poster and all the time the display was up it sparked conversation about the upcoming movie. After Halloween, I altered the display to go from Halloween to Tolkien based in celebration of the upcoming movie. Most of the visuals remained the same but I switched out the Halloween chosen pieces for works of Tolkien’s such as ‘The Washing Up Song’ and ‘Song of the Misty Mountains’. As both these pieces were featured in the movie, it was wonderful to be able to have the originals up on the bulletin board for students to find. When the movie came out, the board helped to create dialogues about it as students knew that I had an interest. It was interesting to me how well many of them knew the Lord of the Rings but weren’t familiar with The Hobbit, which led to talking about issues with tone between the movies. As the month of January was a strange one, my next display didn’t go up until February but I decided for it to work as much as possible with the parts of the community that worked on diversity activities. An interesting part of this process involved figuring out who were the best people and groups for me to work with. In the end, the club UMOJA chose the elements of the display. I provided a poster while they told me that they wanted to highlight the work of Frederick Douglass and W.E.B. DuBois. Once I had that information, I explored to find powerful visuals for the display, along the way I was reminded how complex the subject of book covers can be. One of the requests had been for a focus on The Souls of Black Folks and I was able to find a variety of cover interpretations which became part of the board. Looking through my pictures, it turns out I don’t have a picture of that board. March didn’t come together as I’d hoped, I had talked with the art department about a display but due to a number of events in and around the library, our timing didn’t come together. 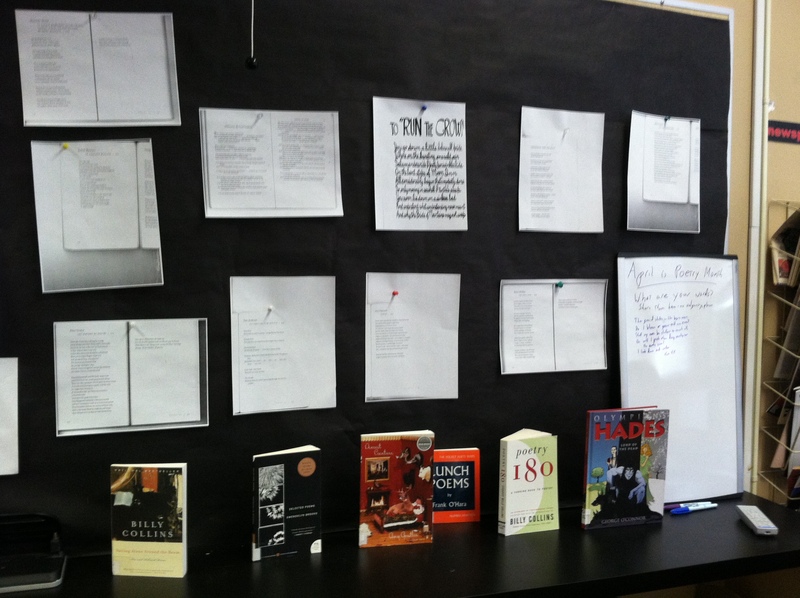 For April, I put together a poetry display that has generated some great responses. I took a risk with this one because I put up a whiteboard and invited students to write their own works on it. To provide a beginning, I wrote a poem on the board myself and since then, two other poems have been added. You can see the display below. Displays have represented a wonderful way for me to connect with the community at Roeper as the bulletin board draws the eye when someone enters the library. I love looking up and spotting a student reading a book that they’ve taken down from the display or seeing someone reading what’s been posted. Planning the displays has given me a way to talk with faculty and student groups about how I’m trying to integrate the library within the community. I’ve found it challenging since the bulletin board is a large space and I’m constantly looking at ways to fill it and make it an engaging spot. What’s missing in some of these pictures is the other about quarter of the display which is taken up with school signage. I have a lot of kids who won’t check the books out, but instead just take them down and read them. It always gives me a nice warm feeling that I’ve chosen something interesting.